A fatal error occured while tyring to sysprep the machine." 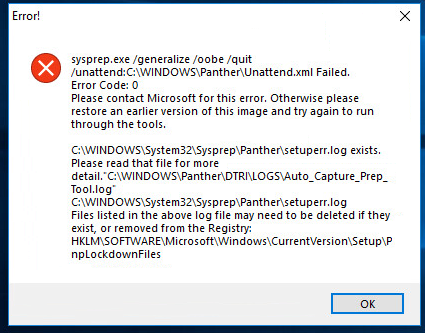 "...sysprep will fail when creating a custom Windows 10 image if there are any apps installed during the image creation process that aren’t also provisioned in the OS." If all else fails, compare your checklist with the detailed comment on this post. you need to activate windows 10 in order to run sysprep on windows 10. Not the answer you're looking for? Browse other questions tagged windows-10 sysprep or ask your own question.